Our main goal is to Develop the person behind the song and equip you to step out on stage confidently & to deliver a unique experience & memorable moment for your audience! Register for a class today and begin your fun experience of mastering your singing skills! Simple, systematic and easy methods used to enhance your clarity, knowledge and application of vocal techniques quickly improving coordination skills! stage presence, appearance and charisma! Learn the fundamental techniques of singing, set realistic singing goals, remove myths and misconceptions. Identify self sabotaging beliefs and habits. Discover your voice type and vocal range. Train the Trainer Coaching Program. 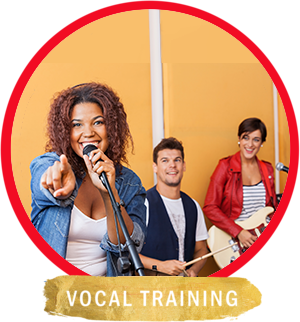 Become a trained and certified vocal tutor. Develop your teaching skills. Learn effective communication techniques to create a learning centered environment. Learn how to set up your singing studio. Receive Basic business setup. Master Marketing & branding techniques. Intensive Mastermind Sessions. Take your skill to the next level with increased technique, develop vocal ease, presence, agility & flexibility. Master articulation, expand your usable range. Develop Effective Phrasing and Stylistics. Yes! Im ready. Sign me up! Systematic, customized strategy sessions & laser coaching designed to quickly enhance your singing skill, craft impacting performance plans, master your stage presence and discover your signature style. Private sessions design based on your personal need and suited to your schedule. Yes Im ready to begin! Every effort has been made to accurately represent our programs & products and their potential. The testimonials and examples used are those specific student's results, and are not intended to guarantee that everyone will achieve the same or similar results. Each individual’s success depends on his or her background, dedication, desire, motivation and implementation. No refunds or returns will be made on digital/downloadable products.